She says: In 2009, The Daily Show with Jon Stewart sent one of the cast (Jason Jones) to Iran to do a real on-location segment for their fake news show. One of the individuals interviewed for the program was journalist Maziar Bahari. As with many Daily Show items, the resulting segment was both amusing and educational. Unfortunately, the mock interview was then used as the pretext for the actual arrest of Bahari, who went on to spend 118 days in an Iranian jail, with no trial. On his release, Bahari wrote a book about his experience. And last summer, Jon Stewart directed a movie based on that book. 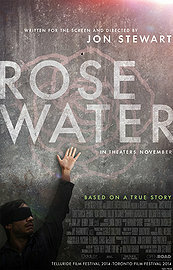 So, Rosewater is not a comedy. On the other hand, it’s not all grim and depressing, either. The beginning, focusing on Bahari’s coverage of the election in Iran and its aftermath, when the result was rigged, is quite exciting. I’m sure I followed it on the news at the time (via The Daily Show, if nothing else), but I certainly didn’t remember all the details presented of Iran’s thwarted version of the Arab spring. The movie certainly becomes more insular upon Bahari’s arrest, when it focuses on the interrogations and the interrogators, and how Bahari managed to cope, mentally—but I found that part interesting as well. And I was relieved there were no brutal torture scenes. Gael Garcia Barnal, as always, is very good. You wouldn’t necessarily expect that Jon Stewart could make a very decent dramatic film on his first try, but he has. He says: OK. Iran is off the list of vacation destinations. Categories: Movie reviews | Tags: drama, movies, politics | Permalink. Stewart does some interesting things here and there, but overall, leaves plenty to be desired. I’d like to see what’s he got next up, though. Good review.